Too often we forget that long before this country was formed, the land that makes up the Southwest belonged to Mexico. As a result of the Mexican-American War in the 1840s, that territory was ceded to the United States. Between the Treaty of Guadalupe Hidalgo and a later addition in the Gadsden Purchase, the border between Mexico and the United States as it exists today was formed. That history is critical to understanding why the challenges Trump will face in building a border wall only begin with the question of how to pay for it. Back in the 1840’s and 50’s, those agreements didn’t take into consideration the people who live on either/both side of those imaginary boundaries or the terrain they traverse. 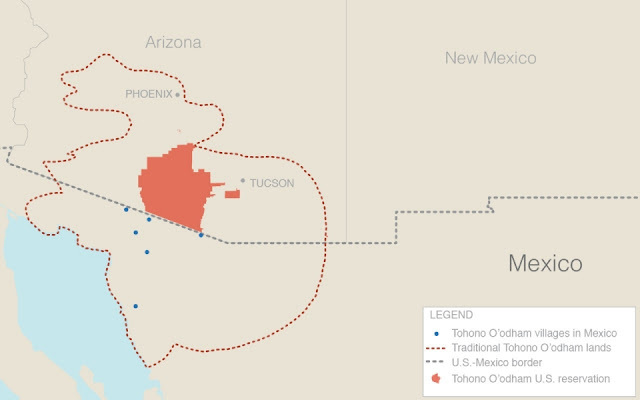 A good case in point is the Tohono O’odham Nation. Their tribal lands exist on both sides of the border along a 75 mile stretch in Arizona. The Tohono O’odham Nation Legislative Council has passed over twenty resolutions opposing a border wall, most recently reaffirming that the Nation “opposes the construction of a physical wall on its southern boundary” (Feb. 7, 2017). The resolution lays out the many cultural, environmental, and historical reasons for opposing a wall. Gerald S. Dickinson explains why that is a huge problem for Trump. Tribes have certain property rights under the Constitution and federal statutes. Many of their lands are held in trusts, which federal law recognizes as independent political entities. Trump would need a bill from Congress to acquire the tribal lands, which are protected by treaties and other statutory equivalents. The southern border of Texas is technically somewhere in the middle of the Rio Grande. The river has changed course in the past, creating boundary disputes between the United States and Mexico. The existing border fencing in southern Texas often sits far from the river, outside its flood plains — creating wide seams between the fence and the official border. Some Americans live on the Mexican side of the border fence. River Bend Resort, a golf course and residence in Brownsville, Tex., sits between a gap in the existing fence. If the wall were completed, based on U.S. regulations, it would bisect the property, according to owner Jeremy Barnard. Roughly 200 residents and 15 of the 18 golf holes would sit south of the border wall. It’s sad that I can imagine an interrupted golf course getting more attention from this president than the disruption of tribal lands. Beyond that, much of the border that isn’t fenced already is in Texas, where, unlike Arizona and New Mexico, the land is primarily privately owned. Apparently Trump’s people are already working on that. Even before President Trump was inaugurated, U.S. citizens who own land along the border reportedly began receiving letters from the Justice Department informing them that the federal government wants their land to build a fence (i.e. the president’s border wall), that it intends to acquire their land and the amount of compensation the government is offering. Yvette Salinas, a Texan whose ailing mother owns a small parcel of land with her siblings near the Rio Grande was informed by the “Declaration of Taking” letter sent by DOJ that her 1.2 acres was worth $2,900, according to a story in the Texas Observer. She told the Observer that the family’s 16 acres has been in her family for five generations. Failure to convince these people to sell their land would mean that the administration has to rely on taking it via eminent domain – a legal procedure Trump has attempted to use in his business dealings on a couple of occasions unsuccessfully. As it happens, the president has plenty of experience attempting to seize land on the East Coast. He does not hide his enthusiasm for taking businesses and homes for his own business interests. In the mid-1990s, Vera Coking, owner of a house just off the boardwalk in Atlantic City, was subject to Trump’s wrath when he tried to persuade the local authorities to condemn her property so he could construct a parking lot for the 22-story Trump Plaza Hotel and Casino he had built right next door. He turned to the government-established Casino Reinvestment Development Authority after Coking refused to sell. Trump lost that battle in Casino Reinvestment Development Authority v. Banin. In 1994, Trump threatened to condemn five businesses in Bridgeport, Conn., to make way for an office and entertainment complex and, as he did in Atlantic City, lobbied city officials to exercise eminent domain. It didn’t happen. If the rollout of Trump’s hastily drafted travel ban is any indicator, we should expect sloppy execution of statutory requirements and takings procedures if the administration attempts to condemn border land. Americans do not take kindly to threats to fundamental principles of property ownership, even if some of them (though not most, polling shows) like the concept of the wall and the immigration policy Trump wants to pursue…The wall could lead to the backlash of the century: a resistance movement laced with political, cultural, social and economic consequences. Trump has already gone silent on his promise to make Mexico pay for the wall. He’s now trying to get Congress to come up with the money. But even if he could pull that off, he’s only in the early stages of learning what a dumb idea this was in the first place.